Coming straight from the hit CBeebies TV series, In The Night Garden, Golden Bear released the wonderful Ninky Nonk Pull Along Musical Train. Measuring a huge 70 cm long and consisting of five completely different carriages and trucks, children will be entertained by this wonderful product for hours on end. An incredible number of features are included in this playset. First up is a stacking block set that can be cleverly concealed in the square blue truck when playtime is over. Little ones also love the green oval shape sorting truck. The roof can be removed to retrieve the blocks for use over and over again. On some of the Ninky Nonk trucks there are pop-up features as well as opening and closing doors. These are intriguing for young children and help them develop their dexterity skills. In addition, a series of light and sounds from the actual TV show feature in some carriages including the big orange banana shaped engine. 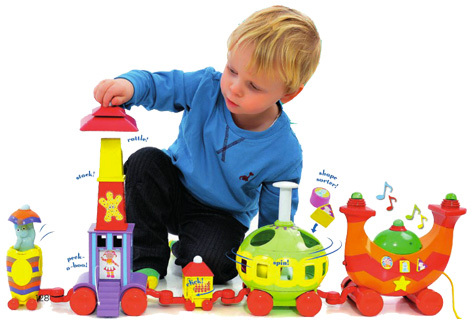 Please tell us what you think of the Ninky Nonk Pull Along Musical Train by In The Night Garden and Golden Bear.